Just in time for Thanksgiving, I wanted to share one of my favorite dessert recipes with you! This dessert combines three of my favorite ingredients - pumpkin, cheesecake, and chocolate. I made a video all about these pumpkin cheesecake bars over on Youtube, and I would be SO very happy if you checked out the video and let me know what you think. In the video, I share some tips on how to make this cheesecake perfectly, so I hope you find them useful! And while there’s no shortage of raw vegan cheesecake recipes on the net, there aren’t too many for baked vegan cheesecake. For some reason, there’s a commonly held assumption that you can’t bake a vegan cheesecake, that all vegan cheesecakes have to be raw in order to taste good. Well, I am here to prove that assumption very wrong. I mean, I do very much enjoy raw cheesecakes, but as tasty as they might be, they lack the super-rich, dense texture that a traditional cheesecake has. And these baked vegan pumpkin cheesecake bars have just that - they are rich, creamy, and decadent. But, unlike traditional cheesecake, you can have more than one slice without falling into a sugar coma. And unlike baking a traditional cheesecake, there’s no need to bake this in a water bath to prevent the surface from cracking. There’s also no need to check the oven every five minutes to ensure the cheesecake is fully cooked through and worry about giving your guests salmonella. To make this recipe as easy as possible, I opted to bake this in a standard 8x8 square baking pan instead of in a springform pan. That way you don’t have to worry about whether you have the right springform baking pan size. And to make these bars extra pretty and fit for your holiday table, I turned pumpkin cheesecake into pumpkin swirl cheesecake. Sure, it involves an extra step but it’s so very pretty. For the crust, I knew I wanted the flavors to include ginger, since ginger and pumpkin are a match made in heaven. But, to give the taster a little something unexpected, I added a bit of cocoa for a chocolate-ginger crust. 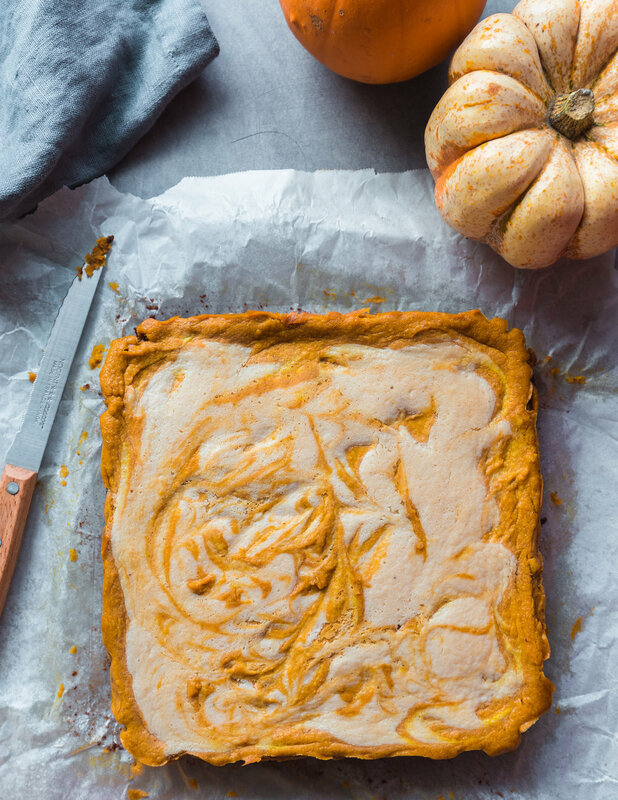 Hope you enjoy this recipe for Baked Vegan Pumpkin Cheesecake Bars and the video! *There is 1/2-3/4 cup of solid coconut cream in a 13.5-ounce can of coconut milk. You can also buy canned coconut cream separately. Line an 8x8-inch (20x20 cm) square pan with parchment paper. Lightly grease with coconut oil to prevent sticking. Preheat the oven to 350°F (~176°C). Make the Crust: place the walnuts, pecans, gingersnaps, salt, and cocoa powder in a food processor and blend until the nuts and cookies are until mostly pulverized. With the motor running, pour in the melted coconut oil, scraping down the sides with a rubber spatula as needed. Once you have a slightly sticky texture that you can press together, press it evenly and firmly along the bottom of the prepared pan. Make the Cream Cheese Filling: Add the soaked cashews and solid coconut cream to a food processor and blend until the mixture resembles ricotta cheese. Add the remaining Cream Cheese Filling ingredients and blend until smooth and creamy, scraping down the sides as needed. It will take a few minutes to fully pulverize the cashews. Transfer 3/4 cup of the Cream Cheese Filling to a bowl and set aside. Make the Pumpkin Cream Cheese Filling: To the remaining Cream Cheese Filling in the food processor, add the pumpkin purée, maple syrup, cinnamon, ginger, nutmeg, and allspice. Blend until combined. Pour the Pumpkin Cream Cheese Filling over the crust. Dollop the Cream Cheese Filling on top and swirl with a toothpick or skewer to create a marbled effect. Bake in the oven at 350°F (~176°C) for 40-50 minutes, or until the edges look very slightly dry and the center appears just a little jiggly but not wiggly. Let the bars rest for 10-15 minutes at room temperature, then transfer the pan to the refrigerator to let cool completely, for at least 4 hours or overnight. Slice into bars when ready to serve.